The New Year is here! A lot of homeowners invest money into their properties at the beginning of the year, and one of the most common major purchases is a new water heater. It’s a smart investment of your money, too. That’s because a new water heater could actually help lower your monthly energy bills by being more energy efficient than the older model you had in your house. Plus, if you end up selling your home, a hot water heater that still has a manufacturer’s warranty on it can be a big bonus for potential buyers. Not to mention that new hot water heater is a great investment in your own personal comfort, as well. But how do you know which water heater to buy? There are hundreds of manufacturers and thousands of models on the market. Picking the wrong model could be an expensive mistake to make. Our water heater repair and installation team in Fort Collins has been helping Colorado residents find the right water heaters for years. Here are some of our tips that will help you narrow down the choices so you can find the one that’s right for your home. Make a note of what kind of fuel your water heater uses. There are also solar energy and geothermal energy water heaters out there. You should know that it is possible to change between these fuel types. For example, you could switch from a natural gas water heater to an electric one. However, you will likely need to pay a water heater repair professional to do the work for you to ensure that the conversion is done safely and correctly so there could be some added expense. Some fuel methods cost less to operate, though, so the cost of the conversion could be minimal when compared to the energy savings it brings to your home. It’s worth doing some research about your fuel type and whether or not it might be worth converting to another type. Decide what type of water heater you want. You can go tankless, traditional, or a hybrid model. Tankless water heaters have gained popularity over the last couple years for good reasons. They are incredibly energy efficient because they only heat the water that you need when you need it. A traditional tank water heater will keep 30 to 50 gallons of hot water in storage, meaning you’ll be paying to keep that water hot. The disadvantages of a tankless water heater should be carefully considered, though. They include the fact that tankless units are more expensive to purchase and install, and some consumers complain that it’s tough to get hot water out of more than one plumbing fixture at a time. If you have a busy household that often has multiple showers or sinks running at the same time, you might want to stick with a tank. Determine what water heater capacity you need. If you determine that a traditional tank water heater is the right choice for your home, you’ll need to figure out what size of tank you’ll need. The bigger the tank, the more hot water you’ll have ready to use at any given time. Because of that, you might be tempted to buy a big of a water heater as you can fit into your house. However, the more hot water it holds, the more expensive your monthly energy bill will be, so it’s important to pick the size that’s right for your household. An easy calculation is to assume you’d need about 12 gallons of hot water for each person in the house at max usage, which is usually in the mornings when everyone is getting ready for the day. Multiple that 12 gallons by the number of people living in your household. So, if there are currently four of you, you’ll need a hot water heater with at least a 48-gallon capacity. It’s a good idea to size up a little bit from there to ensure you have hot water for guests or other appliances that need to run in the mornings. If you determine that you want a tankless water heater, you’ll need to make a similar calculation. Because tankless water heaters don’t keep water in storage, you won’t have to worry about the tank size. Instead, you’ll want to determine what flow rate you need. The flow rate is how much water can be heated by the unit every minute. Each item in your home that’s connected to the hot water, like your sinks, showers, dishwashers, and clothes washers, use a different amount of hot water every minute. The easiest way to determine what flow rate you’ll need is to think about which items are likely to be running at the same time. For instance, if you often run the dishwasher while you are taking a shower in the morning and your partner is brushing their teeth in the sink, then you’ll have three items using hot water (the dishwasher, the shower, and the sink). That’s a total of around 4 gallons of hot water being used a minute, so you’ll need a tankless water heater that’s capable of meeting that demand (or you’ll have to skip your morning dishwashing cycle). Think about what extras are important to you. There are a lot of features available on today’s water heaters that might interest you, but first and foremost you’ll want to consider the energy efficiency of the model. While a model with better efficiency is easier on the environment, it’s also easier on your wallet. That’s because it will use less energy to do the same job, costing you less money to operate. All water heaters have an energy efficiency rating, so you can easily compare their efficiency and find one that meets your requirements. The other thing you should consider when making a purchase is whether or not the water heater comes with a warranty. These warranties can offer a lot of peace of mind when making a puchase and give you confidence knowing that the manufacturer will stand behind the product if something goes wrong with it within a couple years of the initial purchase. Almost all water heaters come with some kind of guarantee, but if you are having trouble deciding between two different models it’s worth comparing the warranty and seeing which one offers the better protection. Finally, you need to set a budget for your water heater. It’s a good idea to do a little research about what water heaters are going for that meet your needs and set your budget accordingly. The cost of a water heater can vary a great deal; you can pay anywhere from a couple hundred dollars to several thousand. If you are going with a tank water heater, you can expect to pay around $1,000 for the tank and the installation. If you opt for a tankless water heater, you’ll be looking at around $3,000 for the unit and installation, on average. While you may be able to find deals on tanks or installation, be wary of anything that seems too good to be true; you don’t want to save a few hundred dollars only to discover the job wasn’t done right and you need to pay someone to come in a fix it. Work with a trusted water heater installation team and they’ll help ensure you get the right tank and the installation you need. 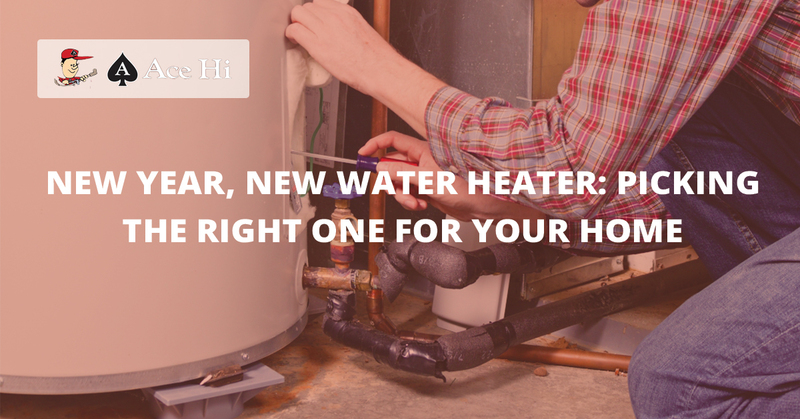 Need help finding and installing a new water heater for your home? Get in touch with Ace Hi Plumbing in Fort Collins. You can give us a call or contact us through our website for an estimate of your plumbing needs today!